Thanks to e-mail, messaging clients, cell phones, and countless other communication tools, it’s easier than ever to stay in touch. And the six applications I list below make communicating with other people even easier, without costing you an arm and a leg. In addition to communication tools, this installment of our multi-part look at the best low-cost software for the Mac profiles Internet and networking applications on the next page. If you missed any of the three previous installments, we’ve already covered enhancers and troubleshooters, multimedia apps, and time savers and shortcuts. The version numbers listed below are current as this article was posted. But software is updated frequently, so new versions could become available by the time you read this; check the developers’ Web sites through the links provided to make sure that your Mac meets the system requirements for the programs. 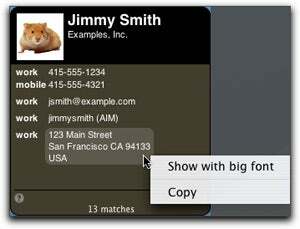 Pop-up contacts BuddyPop gives you quick access to your Address Book info. 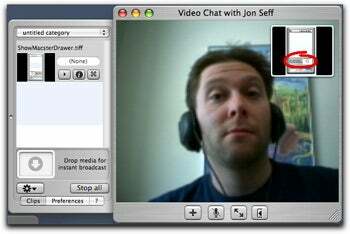 Multimedia chats With ShowMacster, you can display video and images and play audio, in an iChat videoconference. If you’re the type who keeps meticulous records of all your iChat sessions, you need Logorrhea 1.3.1 ( ; free; Spiny ). The application lets you browse your iChat logs by user name, date, and time, as well as search for chat sessions by words and phrases. MailTags 1.2.2 ( ; payment requested; Indev ) delivers organizational moxie to your Mail messages by letting you assign keywords to e-mail, or organize messages by project, for easier search and retrieval; you can also use MailTags to add notes to messages, set and view a message’s priority, and set due dates for responding to messages.